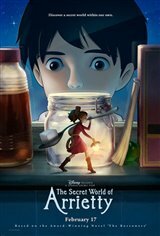 Arrietty (voice of Bridgit Mendler) and her parents, a family of tiny people, live a happy and comfortable life under the floorboards of a suburban garden home, unbeknownst to any of the people living or working in the house. That is until Shawn (voice of David Henrie), a human boy, spots Arrietty. The two form an unusual bond but must keep their friendship a secret. If anyone finds out, Arrietty and her family will be forced to leave the house and enter straight into the line of danger. Based on the classic childrens' novel "The Borrowers" by Mary Norton.